Just 18 months after export advice from UKTI, the company has more than doubled its staff and opened a wholly owned subsidiary in Singapore. 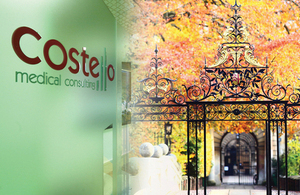 Costello Medical was set up by husband and wife, Richard Short and Sophie Costello, in 2008. Looking for new opportunities to grow, Costello Medical went to their local UK Trade and Investment (UKTI) office to find out what support was available. Soon after, the company received a Tradeshow Access Programme (TAP) ‘SOLO’ grant towards the cost of attending a pharma industry conference in Atlanta in 2010. The visits showed that Asia was a viable market for Costello Medical. By the end of 2013, the company had won contracts with two top 10 Chinese pharmaceutical companies. To support this growing workload, in March 2014 Costello Medical established a wholly owned subsidiary in Singapore. UKTI’s local team provided useful contacts, such as lawyers and accountants, who helped with the practicalities of setting up in Singapore. UKTI has been simply fantastic, their advice and in-market networks have proven invaluable. We’re frankly amazed at how far we’ve got in such a short space of time. We will certainly use UKTI again and I would recommend their services to other businesses. Arrange a face to face meeting with an International Trade Adviser. Cambridge-based Costello Medical Consulting provides specialised market access and medical communication services to the pharmaceutical industry. Since it was set up the company has grown to achieve a turnover of £2.3 million.